State of the art equipment from top American bands; Precor, Atlantis and Hammer Strength in designated areas focused on cardiovascular, resistance and free weight training. Enjoy relaxing in the eucalyptus steam room and sauna. Automatic lockers and vanity counters are available in all the changing rooms for a post work out rejuvenation. Free large parking lot accessible to members only. An internet lounge with complimentary Wi-Fi to stay connected. You will have access to browse your favorite websites such as Facebook, YouTube, Google, etc. In addition you will find that daily newspapers and magazines are provided for your convenience. 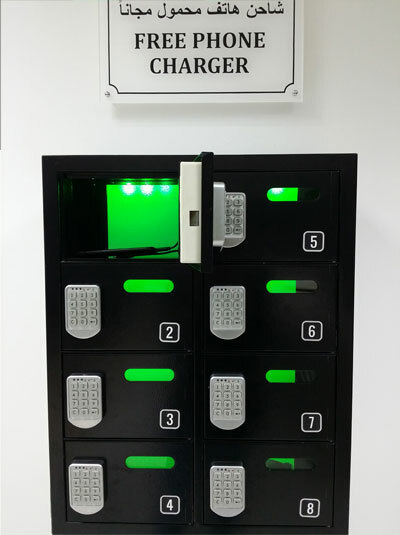 Charging station kiosk is available for the convenience of members to charge their devices while they train. Prayer room is available throughout the opening hours for all members to meditate in peace & serenity.